They realize the value of a comprehensive view into capacity and demand: Higher maturity companies are 48% more likely to have a combined, holistic view into capacity and demand, whereas 72% of lower maturity companies ranked visibility as their top pain point. Most are flying blind; they can’t see their capacity, and they don’t know the demand coming in. Their more advanced counterparts are able to reap significant benefits from their added visibility, including greater business agility, fewer fire drills, and more capacity to innovate. They always consider capacity in the project approval process: Mature companies are 4 times more likely to ‘always’ consider capacity. It’s engrained into their thinking process. Put simply, they don’t blindly take on work. They assess whether the capacity is there at a role level, and if not, they schedule the work when it is, or make tradeoffs accordingly. They have far fewer unplanned projects: Lower maturity companies are almost twice as likely to have unplanned projects, leading to downstream effects on resources, portfolio, timelines and budget. Backdoor projects aren’t the exception; they’re the norm. On the other side of the spectrum, more than half of mature companies experience less than 20% unplanned projects, giving them a greater ability to execute on their strategic vision while maintaining their sanity. They conduct continuous, consistent capacity planning: All high maturity companies reported conducting capacity planning, and 76% do it monthly, weekly, or continuously as part of their process. In stark contrast, 62% of lower maturity companies simply don’t do capacity planning (20%) or do it inconsistently (42%). To be effective, capacity planning must be an inherent part of the intake and scheduling process for new projects, supplemented by strategic longer-range capacity planning. Assessing capacity once a year or once a quarter or on an ad-hoc basis simply doesn’t allow for the dynamic changes that take place on a day to day basis in today’s world. They can evaluate and make decisions quickly: High maturity companies are twice as likely to be able to evaluate capacity for an emergent or unplanned project in minutes/hours/days than their lower maturity counterparts, who can spend months deciding whether they can take on an effort or not. Today, businesses must operate at the speed of light or risk being late to the party every time. Those with a greater view of capacity are more able to do so. They rely on purpose-built software, not spreadsheets, for capacity planning. While 75% of lower maturity companies rely on spreadsheets, desktop tools, or have no software for capacity planning, higher maturity companies are more likely to have purpose-built enterprise software, providing them with more accurate data available in real-time. With resources typically being leveraged from across the organization to work on competing bodies of work, it takes an enterprise solution to address an enterprise issue. They have a strategic, capacity-centered Project Management Office (PMO): 68% of higher maturity companies have a PMO or are in process of establishing one, and are 25% more likely to have an established PMO than lower maturity companies. Moreover, higher maturity organizations are establishing a more strategic, enterprise-wide role for the PMO with capacity and investment planning as a key part of their charter. These aren’t your grandmother’s PMOs, which were focused on project execution, rigid methodologies, and reducing throughput of work by injecting layers of bureaucracy. Instead, the modern PMO is a strategic enabler that can help the organization gain the most value out of their limited resources. Looking at this list, is your organization capacity-centered? If not, and if you’re looking to boost agility, innovation, and productivity, these areas are certainly worth considering. 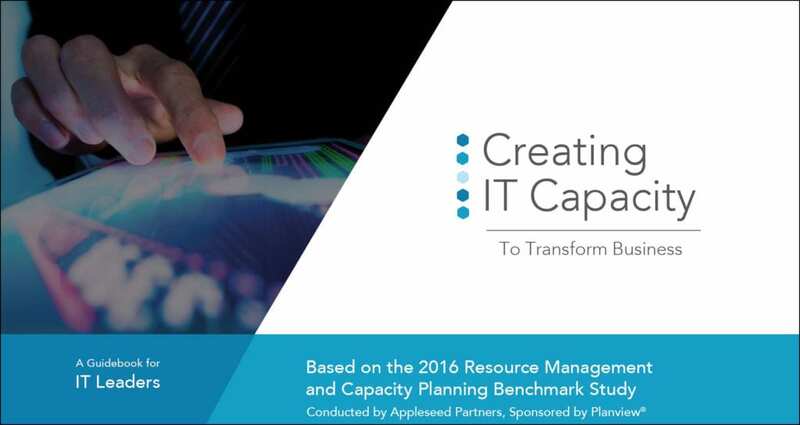 Read the guidebook, “Creating IT Capacity to Transform Business” based on the 2016 Resource Management and Capacity Planning Study. Get insight into how PPM can help your company become a capacity-centered organization. Previous Planview Blog post, Meetings Killing Your Black Friday Vibe?